Anise was domesticated by humans over two millennia ago, with researchers believing it was first cultivated as a food crop in China. The importance of anise throughout history dates back to the Roman Empire, where it was used as a spice and fragrance. It began being cultivated in England as a food crop in the 1500s, and has since spread throughout the world, becoming a staple spice and popular herbal remedy in many different cultures. Treating and preventing gastrointestinal issues. Anise have been used for centuries to relieve stomach problems, such as gastric ulcers, nausea, and constipation. Relieving menstrual cramps and menopause symptoms. Its antispasmodic and estrogenic actions help relieve menstrual problems, as well as menopause symptoms caused by estrogen deficiency. Treating cough and respiratory ailments. The expectorant action of anise promotes secretion from the mucous membrane of the air passages, facilitating the expulsion of phlegm. In terms of micronutrients, anise is rich in vitamins B3 (niacin) and B9 (folate), as well as minerals like iron, calcium, magnesium, potassium, zinc, and copper. Traditional treatments include the dried and crushed seeds of anise infused in hot water as a carminative, antiseptic, diuretic, digestive, and aphrodisiac, as well as a remedy for insomnia and constipation. In Arabian traditional medicine, anise seeds and oil have been used for the treatment of various conditions including dyspepsia, nausea, abdominal colic, seizures and epilepsy. The main constituents of anise are estrarole, anethole, eugenol, anisaldehyde, methylchanicol, coumarins and terpenes. These compounds have shown antioxidant and antimicrobial properties, which are thought to be the reason for anise protective effects on the gastric mucosa. 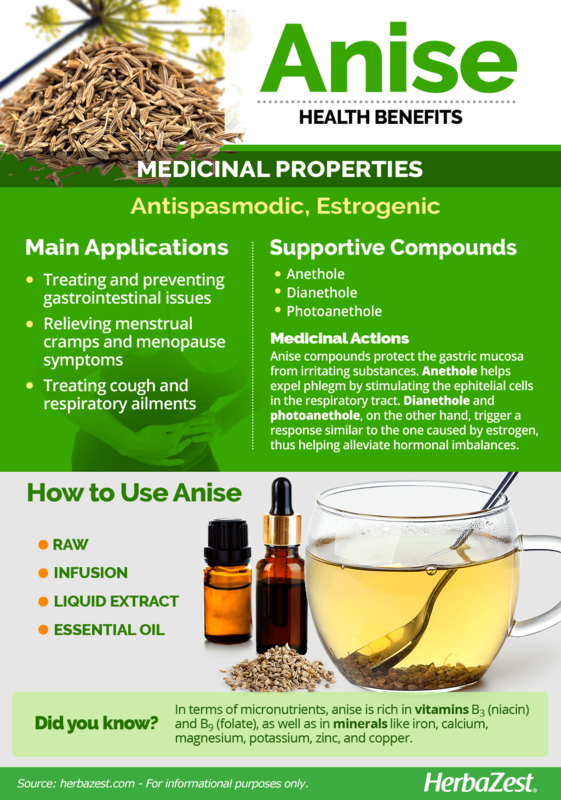 Although the exact mechanism of action is yet to be known, anise provides a muscle relaxant effect (antispasmodic) and contributes to maintain the structural integrity of the gastric epithelium against irritating substances. Additionally, the expectorant action of anise is attributed to anethole - a natural alcohol that also provides anise its distinct flavor and sweetness - which can stimulate the upward waving motion of ephitelial cells in the respiratory tract, helping to expel phlegm. Furthermore, dianethole and photoanethole - derivatives of anethole - seem to be responsible for the estrogenic action of anise. They bind to cells' estrogen receptors, triggering a response similar to the one caused by estrogen. ANISE IS COMMONLY USED TO ALLEVIATE GASTROINTESTINAL COMPLAINTS BECAUSE IT PROTECTS STOMACH LINING. Chamomile and guelder rose also possess antispasmodic properties, and similar estrogenic benefits can be found in herbs like alfalfa and dong quai. There are no reported side effects of regular anise consumption. However, the ingestion of as large quantities of anise essential oil may cause nausea, vomiting, seizures and pulmonary edema. People who are allergic to plants similar to anise may experience reactions that range from mild to severe and can include symptoms as rhinitis, angioedema, asthma, urticaria, eczema, abdominal pain, vomiting, and diarrhea. Since anise has an estrogenic action, women with breast, uterine, or ovarian cancer, endometriosis, or uterine fibroids should avoid its consumption. Because of its anticoagulant action, people taking anti-thrombotic medication or about to undergo surgery should consult to a doctor before consuming anise. While normal consumption of anise is considered safe during pregnancy, excessive use in concentrated forms is not recommended for women who are pregnant since it can cause miscarriage. There are many ways to consume anise in order to enjoy its nutritional and medicinal benefits. Because of its strong taste, it is usually not consumed raw, but it is commonly used as an addition to meals and desserts. However, medicinal forms offer a higher concentration of anise's properties. In the Mediterranean, it is very common to drink anise liquor with or after meals to support digestion. Raw. Fresh or dried, the seeds of anise have an aromatic scent and a distinctive licorice flavor. They can be chewed as an herbal breath refresher, or be used in both medicinal and culinary preparations. Infusion. It is common to brew the seeds of anise into a warm infusion to soothe stomach aches, flatulence, and infant's colic, as well as for treating H. pylori, respiratory tract infections, dyspepsia, and stress. Pimpinella anisum extract should not be confused with star anise extract, which can be toxic for infants. Liquid extract. Obtained through an absorption process, anise liquid extract has both oil and alcohols in its composition, and it is used to treat a variety of conditions, such as digestive and respiratory problems, high blood pressure, and menstrual pain. Essential oil. Anise oil is obtained by the distillation of anise seeds, and all properties and licorice flavor of the plant are concentrated in this form. It is often used to relieve rheumatic and arthritic pains, and also has relaxant and sedative effects. The antispasmodic effects of anise liquid extract have been traditionally used to relief infants' colic. Raw anise is easy to find in most grocery stores and local markets around the world. Whole seeds are the easiest form of raw anise to find. In the U.S., the most widely available varieties of anise are yellow anise and Florida anise. 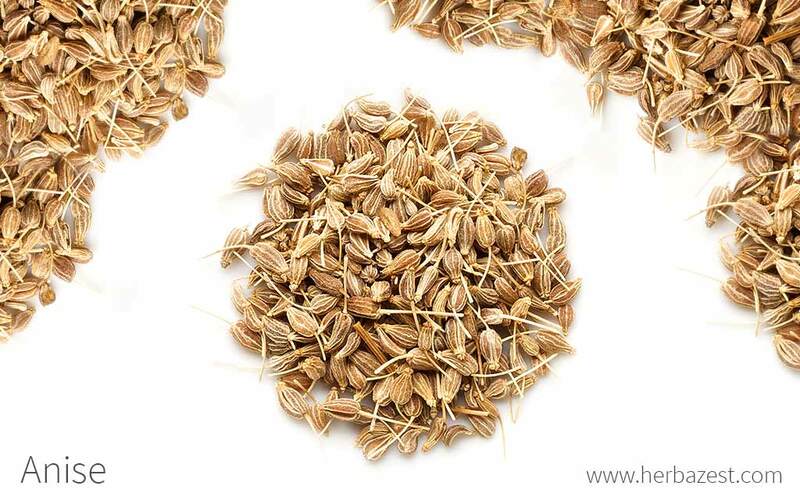 Although anise seeds are mostly bought in fresh state, they are also available dried, in bulk and teabags in most supermarkets and herbal shops. Anise supplements are mainly found in specialized health stores. In addition, there is a wide variety of anise supplement choices available through online retailers, and each brand may come with different concentrations. Before buying any anise products for medicinal purposes, it is important to read the labels since this herb is often confused with star anise, which is a completely different species, with its own set of health benefits and side effects. Anise is regarded as a rather difficult to cultivate. Although it grows well under standard temperate climates, it doesn't endure well transplantation or excessive manipulation. Anise grows best in well-drained and fertile soil. Fertilization should only be considered when the soil is poor. It also requires plenty of daily sunlight. Anise plant thrives within a life zone of 46 - 73°F (8 - 23°C), with 16 - 67 inches (0.4 - 1.7 m) of precipitation and a soil pH of 6.3 - 7.3 (neutral to slightly alkaline). The ideal spacing between plants is 6 - 12 inches (15 - 30 cm). Plant stems are often weak, but a line of string along each side of the row will prevent them from flopping over. Plants should be watered only late in the afternoon or at night. Anise may flower as early as six weeks after sowing, but ripening of the seeds may take up to four months of growth, and requires summer heat. Detailed information about growing anise can be found in the herb garden section. Anise is a flowering plant that may grow up to three feet (1 m) tall and can be identified by its feathery and pinnate green leaves, and white oblong-shaped flowers. These flowers produce a small fruit, which constitutes the most commercially important part of the plant. Pimpinella anisum is a member of the Apiaceae family, also known as the carrot or parsley family, which contains approximately 3,700 species; many of them are well-known culinary herbs, such as carrot, celery, coriander, cumin, dill, fennel, hemlock, Queen Anne's lace, parsley, and parsnip. Over the course of history, different varieties and subspecies of anise have been cultivated through selective breeding in different regions of the world. The Spanish Anise, sold as Alicante Anise, is the largest and best adapted for medicinal use, as it yields about 3% oil. There are two North American varieties of anise: yellow anise and Florida anise. The largest producers of anise are Russia and Poland. Anise contains anethole, an essential oil that is used in various industries, particularly in the culinary industry. This oil is used in producing everything from candy to bread, as well as in many East Asian dishes. However, because this oil is also found in an unrelated herb, star anise, which is less expensive to produce, the production of essential oil of anise was only eight tons by the turn of the 21st century. Flavoring. Anise is widely used in the kitchen, as well as in the food and pharmaceutical industries to flavor pastries, cheese, bread, beverages, drugs, and cosmetics. Breath refresher. In many cultures around the world, anise can be chewed to relieve bad breath. Fishing. Anise essential oil can be used for manufacturing liquid scents that can work as effective bait for attracting fish. Aromatherapy. Anise essential oil is very popular in aromatherapy. Its fresh, sweet, spicy scent is used to relieve nausea, as well as a morning stimulant. University of Florida, Anise—Pimpinella anisum L.
European Medicines Agency, ASSESSMENT REPORT ON PIMPINELLA ANISUM L.